September 9, 2012: The basic benchwork structure is just about done, the only thing remaining being the section spanning the doorway at the entrance to the room. I'm still trying to work out the details of construction on that. 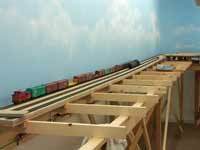 The following photos are of the initial roadbed and track construction. I'll be wiring everything as I go as well, so whatever track goes down will be operational shortly after I walk away from it. 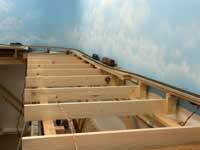 I've been working on the sub-roadbed and the supporting risers, along with a multitude of other things around the layout, but didn't bother to post any new photos until I actually had some track installed. Well, here it (finally) is! 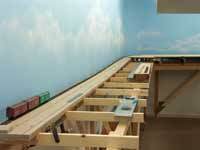 The first photo is a quick shot I took just after laying the first switch and a bit of track. 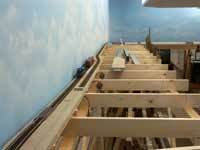 The photos after will be following the progression of the track installation. 1/20/13: The Tin Spike has been driven. 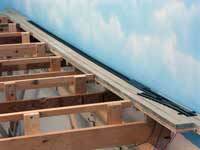 This is the first trackage to go down on the LCRR. 2/3/13: The diverging track is now installed. The track at left curves around to the far wall. 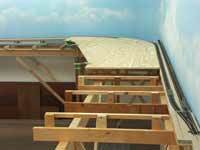 2/3/13: This view is from the far end of the staging track seen curving to the left in the previous photo. 3/12/13: A view similar to the previous photo, but showing the I.C. staging tracks now in place. 3/12/13: A view similar to the above photo, but showing the I.C. staging tracks now in place. 3/12/13: This shows where the I.C. 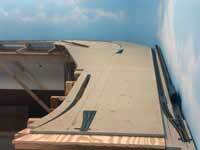 main will enter the visible portion of the layout (at center). 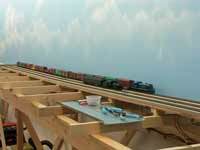 8/11/13: Okay, here's a view of the south staging area, now shown with the track mostly in place. 8/11/13: Looking the other direction at the south staging. The I.C. track is left, the T&P track has the offset.